Recently I had an opportunity to work on a project with WARE, an outside-the-box thinking company based in Louisville, Ky. 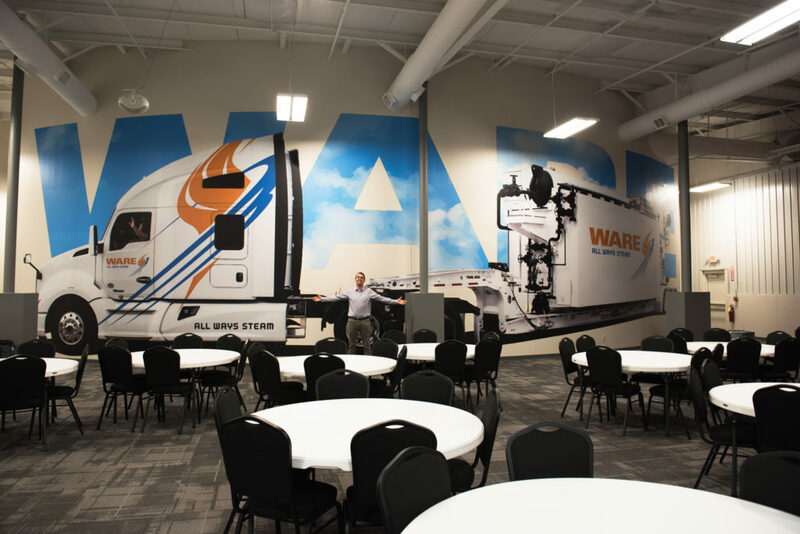 The end product was a print of a tractor and trailer as life-size as possible, oh, and did I mention the print would be placed on an indoor 30 degree wall? Sounds like a lot of fun right!? How does one go about getting started? Well, the photography obviously needed to take place outdoors on a day with great lighting. Next up would getting a massive semi turned at a 30 degree angle to match the 30 degree wall it was going to call home, this way the perspective is accurate making the print as life-like as possible. It took a team and a skilled driver to get everything arranged for the photography. Once the truck was in place and prepped we metered the light. Finally, we took some test shots from a couple of angles and focal lengths until we found the feel and look that was proper. Projects of this size and vision are what Image Detail looks forward to creating.